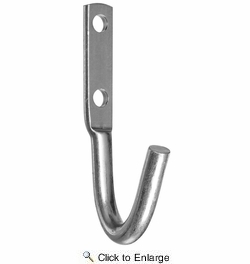 National N220-582 3-1/2" Tarp/Rope Hook - Zinc Plated. Designed as a tie-down anchor for tarps, boat lines and other home and industrial applications. Medium weight hook. Hook has a blunt end. For interior and exterior applications. Manufactured from steel wire. Safe Working Load (SWL) 180 lbs.